The gorge on the North Fork of the Middle Fork of the Willamette is a fun section and a good cool down after a couple of springtime laps on the Miracle Mile. You can also use this as an alternate put-in for the class III run to Westfir if you want to add some excitement to your day. 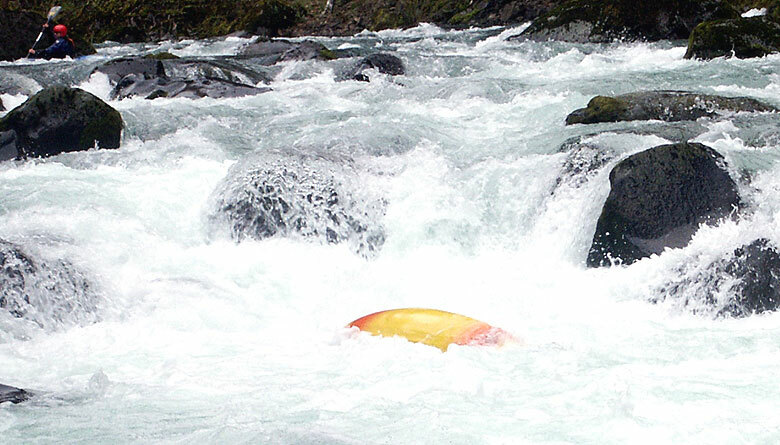 Just below the Christy Creek bridge (the take out for the Miracle Mile) lies Dragonslayer, a gnarly chunk of whitewater that is often portaged on the left. Most of us have run this drop but I personally almost always opt for the portage, especially when the gauge is reading over a foot. At this flow Dragonslayer is brutal, with a tricky lead in to a super nasty right side slot that most of the water is going into. The hole in this slot has torn the boots off of boaters, pinned them to the bottom, etc, etc. There is no way to rescue someone trapped in this hole, so you are in for a helluva thrashing if you get into it! Dragonslayser is immediately evident below the bridge. If you want to portage, stay left and paddle until you run out of water, then do a short carry over some boulders into a pool below Dragonslayer. Tim on a boulder below Dragon Slayer. It is difficult to see here, but most of the water is going down into the barely visible slot indicated by the blue arrow. The rock ledge in the middle of the river folds around slightly, backing up the flow and creating a particularly vicious hole. The arrow is pointing directly down into this infamous 'Dragonslayer hole', which has thrashed many a bold paddler. The lead-in to this drop is long and can be pushy depending on the flow. 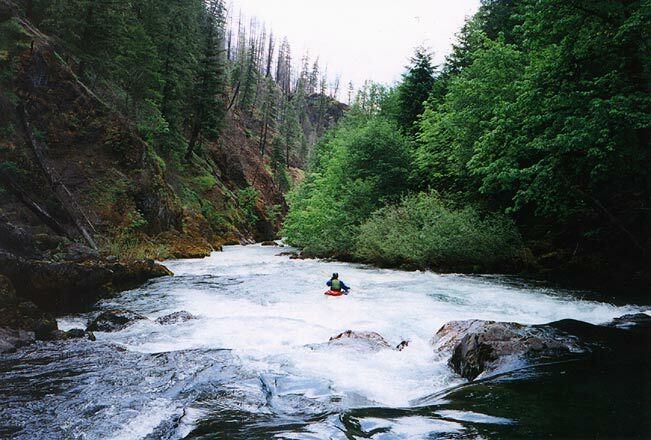 Below Dragonslayer are some fine class III rapids, great fun with easy routes and nice waves. Below here keep an eye out for Spinal Compression. Here the river disappears over a horizon line and drops into a headwall on river right. This steep, bouncy boulder garden is always fun and is run more or less down the middle. Keep your boat straight, and watch out for wood. In the class II rapid immediately below Spinal Compression there have been logs lodged in the past, so stay alert and be ready to scramble about as necessary. Below the logs are a couple of really fun class III drops and then the river mellows for about a mile paddlers approach the actual gorge. 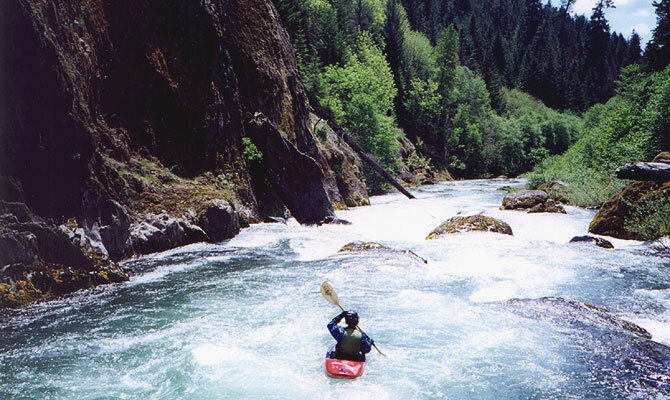 There really aren't any rapids in this section, so sit back and enjoy the scenery. After a series of class II shoals the river bends back to the left, drops under a bridge, and the action starts again in earnest. Below the bridge there is a log on the left side, scramble around it and then enjoy several nice class III to IV (depending on flow) rapids in the gorge. At higher flows (above 1.5 feet on the bridge) the rapids in here are pushy, with big holes and nice waves. Tim enters the middle part of the gorge. The hillsides downstream are still scarred from a fire a few years back. Soon the river bends to the right and drops out of sight. 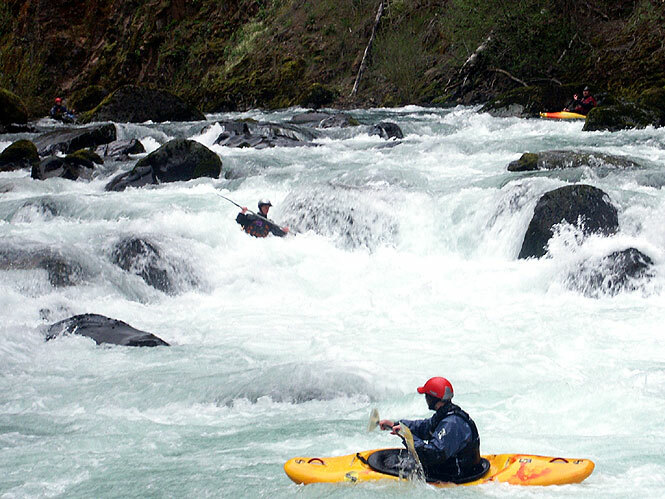 This is the biggest rapid in the gorge, and it warrants a careful scout on the right. You can scout this one ahead of time on the drive up; keep your eyes peeled for a big blot of white through the trees and then scramble down a trail to scout. 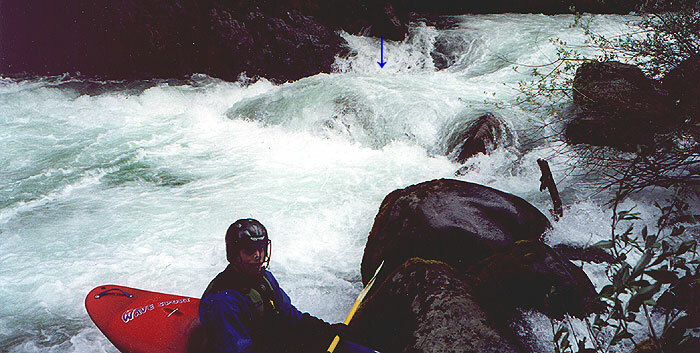 (Note: There is also a good picture of Pete dropping through this slot on Pete's bio page) Immediately below the slot drop the river bends back to the left in fast water and drops over the last major rapid in the gorge. Recently a large pillar of rock fell into this rapid on the left, making the moves a bit more consequential. Stay middle right, and then relax for the mellow floating all the way to the take out bridge just downstream. Tim above the last drop in the gorge. Note the large pillar of rock forming a narrow slot against the wall on the left. Must of the water goes into the pillar, but it can be avoided with a few decisive strokes.